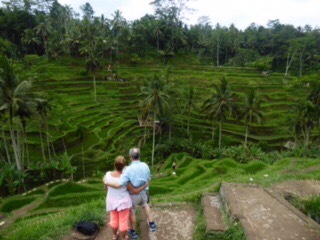 Where can I begin to tell the story of beautiful Bali and the Balinese people? 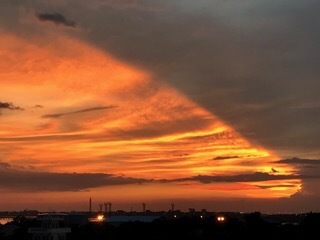 Almost everything has a spiritual meaning here. 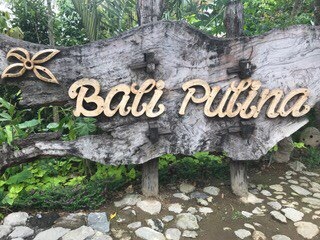 While there are beautiful beaches and surfing, diving and all kinds of sports, it is the essence of the people that really make this place special. They are a very warm and welcoming people. Their colorful dress and their smiles make you feel at home instantly. And the many temples surround you everywhere you go. 90-95% of the population is Hindu and it is a quite different practice here than in India. 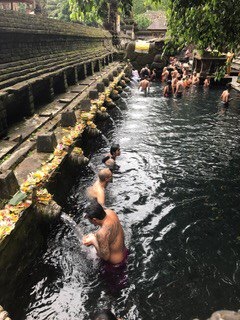 Although there are similarities, Hinduism here focuses more on the whole being and a freedom of happiness than the physical practice of yoga, etc. 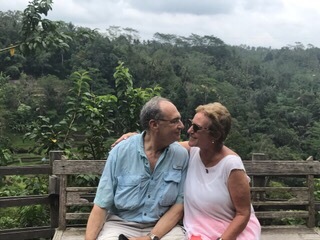 We spent two days in Bali, a place we have never visited before. 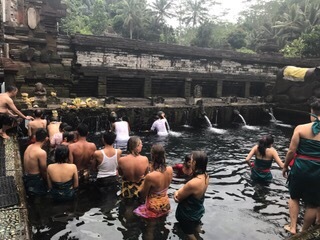 The first day we did a tour with about 18 people called Discover Bali. 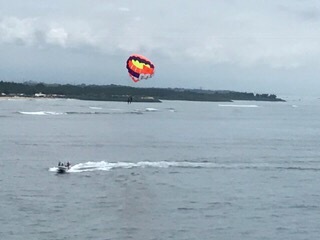 We saw a veritable playground of activity when we arrived – boats, parasailing, etc. 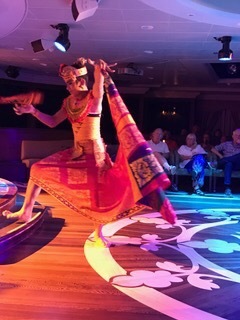 And we were greeted at the dock with traditional music and dancing. 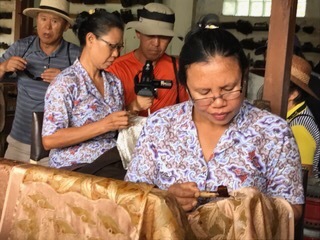 We arrived in Bali at about noon and set out on the tour to Tohpati Village for a demonstration of Batik cloth processing. 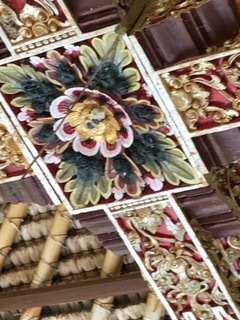 We have seen Batik before but the Balinese style is a bit different. 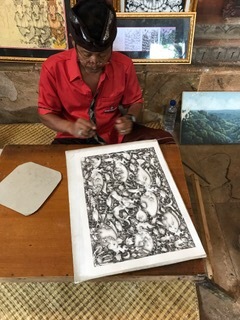 They use either hand drawn art or stamped art and they use more cotton than silk. Interesting demonstration and of course I did buy a scarf! 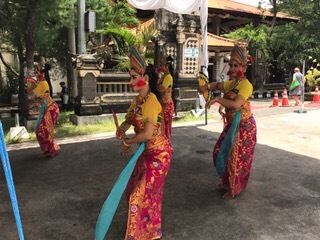 An unexpected event was the opportunity to see a traditional Barong and Kris Dance at Stage Chandra Budaya. 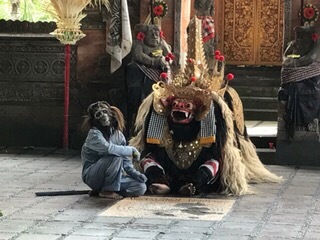 The Barong Play represents an eternal fight between good and evil spirits. 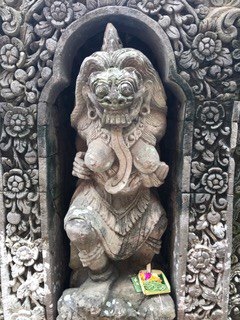 A Barong (mythological animal) represents good spirits and Rangda (a mythological monster) represents evil ones. The costumes were quite spectacular and the play was so interesting. Luckily we got a printed description of the 5 acts as there is no dialogue at all and the story is all told through movement and music. 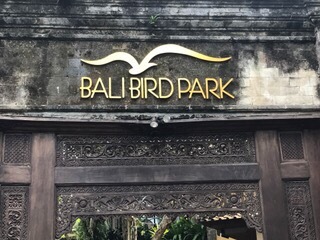 We visited the Bird Park which was so beautiful. 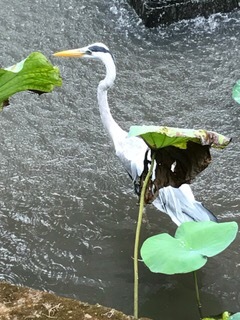 The vegetation and the beautiful birds captivated us for over an hour. 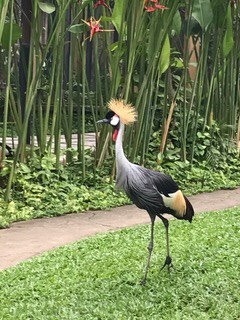 It has the largest collection of Indonesian birds in the world as well as many varieties from Africa and South America. 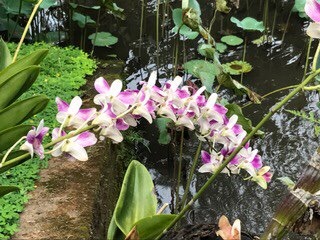 It covers almost 5 acres of botanical landscape and has almost 1000 birds of 250 different species. 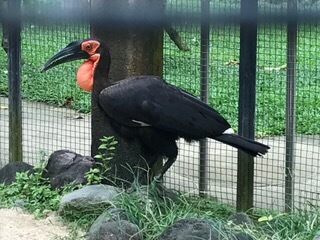 They are free range and a few in aviaries to protect them. 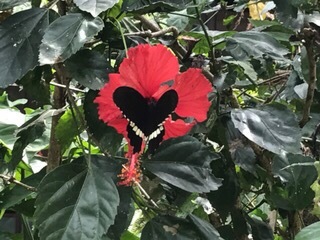 The tropical plants and trees attract a significant butterfly population – I captured one in the red flower. 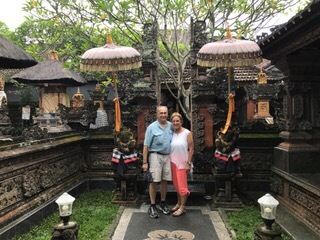 We visited a traditional house compound. 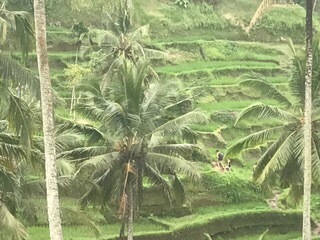 The Balinese home is often viewed as a human organism. 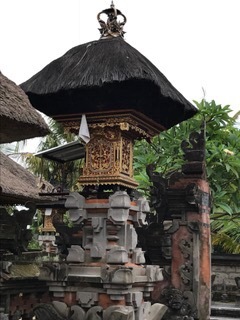 Much like a human being, it has a head (the ancestral shrine), arms (the sleeping quarters and living room) and legs and feet (the kitchen and rice granaries). 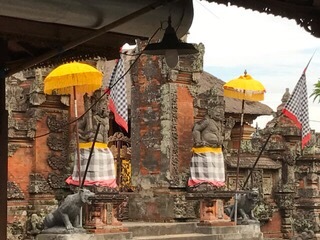 There is always a temple in these homes and the compound and the temple are huge and sprawling. 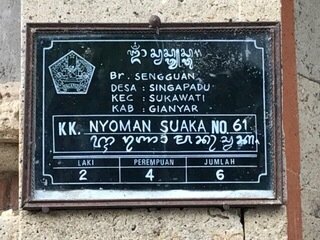 Outside the home on a pillar there is a placque which lists the number and gender of the people who live there. 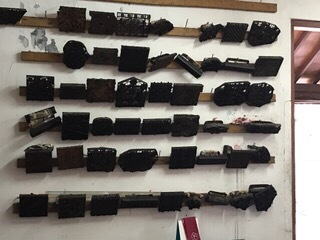 Our guide, Reno, says this is for census purposes. 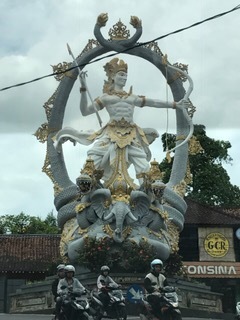 You also see these small shrines everywhere outside as you travel along and the black and white checked material is a symbol of Bali. Inside the homes or temples you might see yellow or yellow and white. 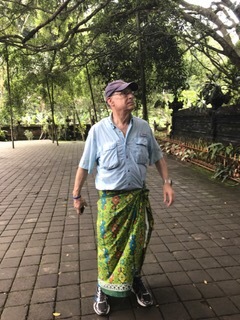 We had to wear sarongs to visit the temples. 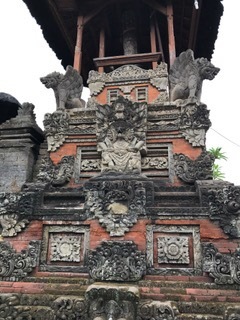 The temples, statues and interiors of the house compound all look quite similar. 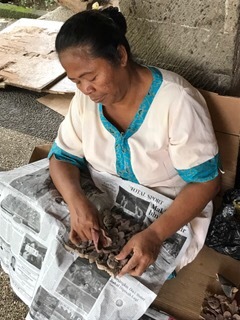 In the Singapadu Temple or Pura Puseh. 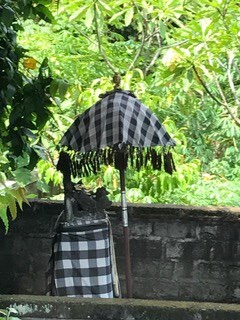 Used in the village for traditional ceremonies. 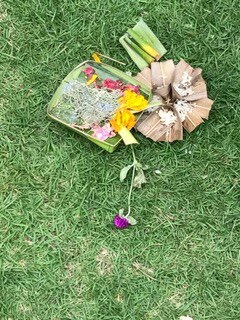 You see these offerings everywhere at the small shrines and all around every temple. 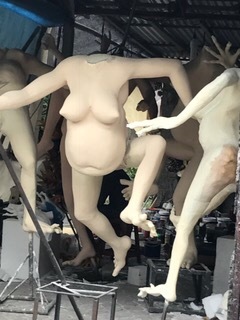 Don’t ask.. these are apparently used in the local celebrations! 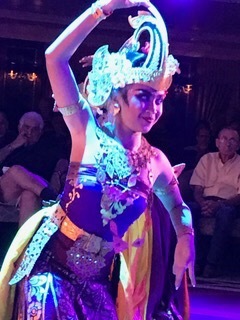 We returned to the ship for dinner, an amazing sunset and a local folkloric show of Bali. The costumes, the music and the dancing were wonderful. Men and women learn the art as early as 4 or 5 years old. What distinguishes their dance is the amazing hand and eye movements. The musicians were mostly young boys and girls and they were terrific! 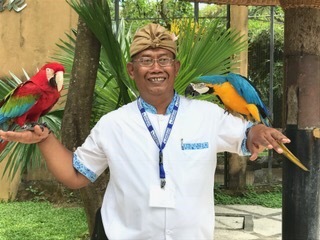 Our second day in Bali, we hired a local driver to take us to places that our onboard lecturer had told us about. 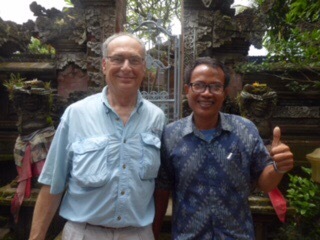 We were surprised to learn that our driver’s name was Nyoman – pronounced Norman! We knew then that it would be a great day and it most certainly was. 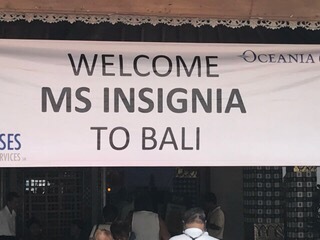 We left the pier at 8:30 in Nyoman’s air conditioned white Toyota which was a pleasure as it was hot and humid. 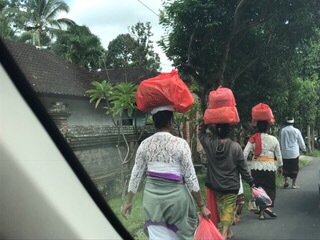 On the way, Nyoman told us the way children are named in Bali. There are 4 names for both boys and girls. 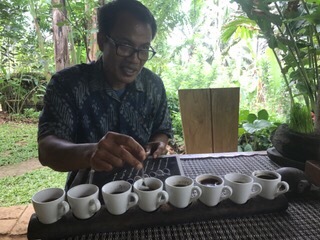 The first born is named Wayan, the second is Made, the third, Nyoman and the fourth is Ketut. 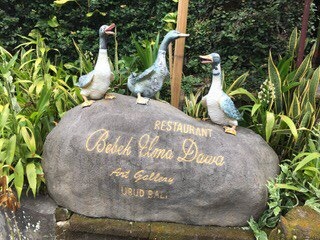 If a family has more than four children, the fifth is again named Wayan! It can get confusing. Many people have nicknames for this reason. Some families use “I” in front of the name to signify a boy and Ni to signify a girl. 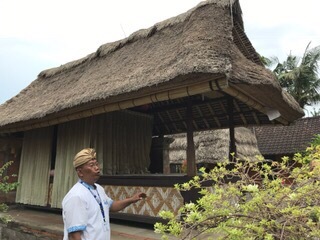 Nyoman was a terrific guide, typical of the kind and smiling Balinese people. 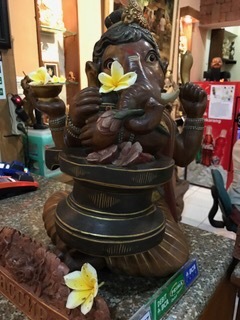 We made a couple of stops at wonderful art galleries in and around Ubud including the Gajah Bali Gallery and Dewa Putu Puja Toris. 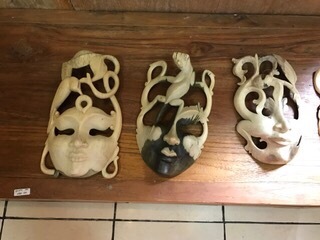 We bought a piece of Balinese art and two of the masks, one natural as in the picture, carved from Hyacinth wood and the other beautifully painted. 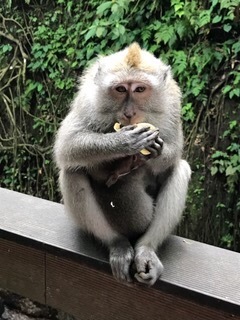 We visited the Sacred Monkey Forest Sanctuary in Ubud. 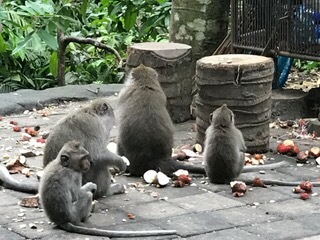 Monkeys everywhere in a wonderful wooded setting. I had my backpack and unfortunately my New Zealand Manuka honey lip gloss was in an outside pocket. The monkeys climbed on top of me and relieved me of the lip gloss- who knows if they could get it open, they were biting on the container pretty hard. 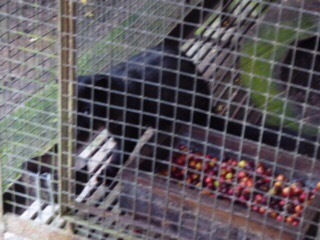 And one came at me with teeth bared – I guess in case I tried to get it back. I knew better than that. 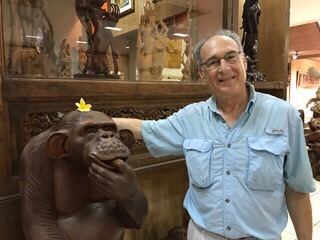 Nyoman got pretty nervous and said not to look the monkey in the eye but just back away. 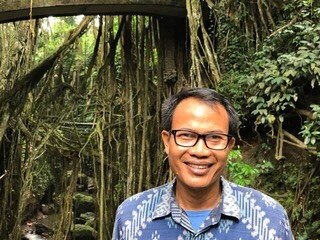 In spite of that, we really enjoyed this beautiful forest. 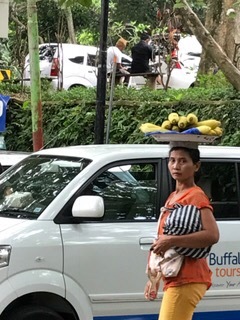 This area has a lot of shops and markets as well. 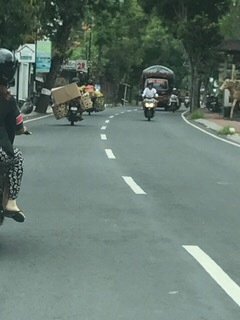 And we saw motorbikes everywhere carrying almost everything. People are all covered in jackets, long pants, etc, and this is because they want to keep their skin as white as they can. Only tourists are in shorts and sleeveless tops in spite of the heat. 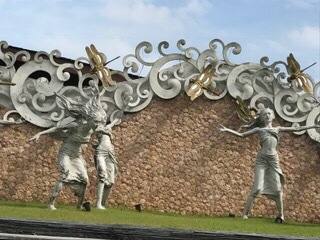 There are a lot of beautiful and meaningful statues along the roads. The traffic really kept us from getting good photos though. 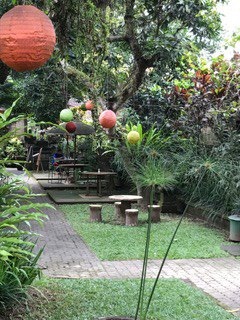 We had a stop for lunch at a lovely Indonesian restaurant, again located next to a beautiful family compound. 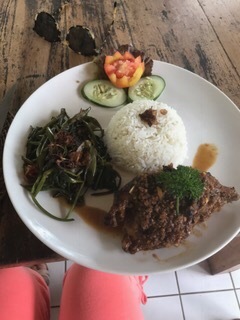 We loved the Indonesian food. 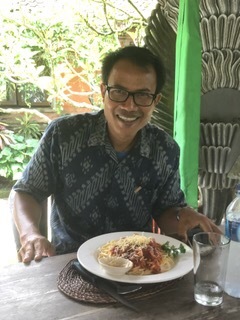 We invited Nyoman to eat with us. 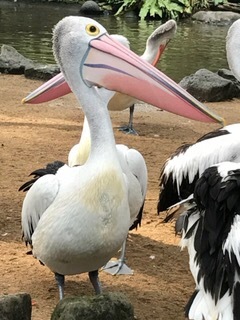 Guess what he wanted? Spaghetti with marinara sauce! 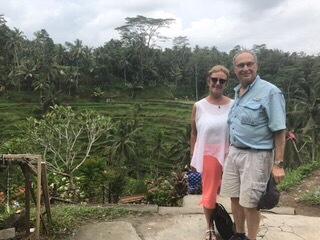 After lunch we traveled to see the magnificant rice terraces. 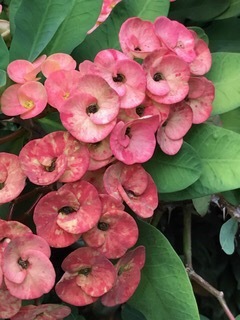 These are farmed by many different people. 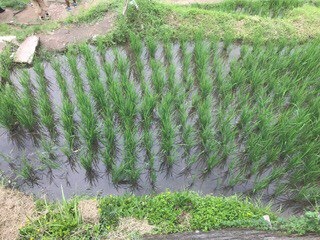 Many families, including Nyoman’s, have their own rice patties which supply their family needs. 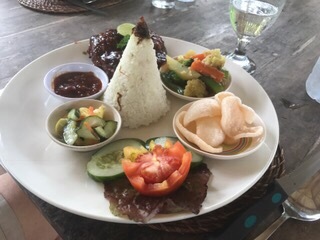 The saying here is that if there is no rice, it isn’t really a meal. 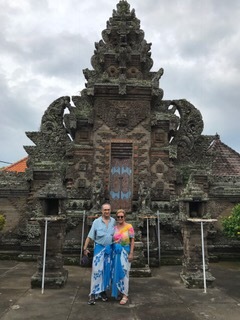 We went to Tampaksiring to see the water temple. 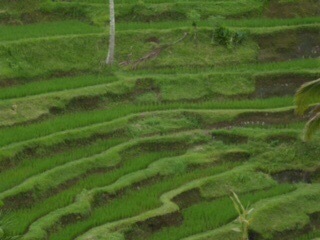 Water comes from the mountains and is sufficient to supply all of these rice fields and terraces. 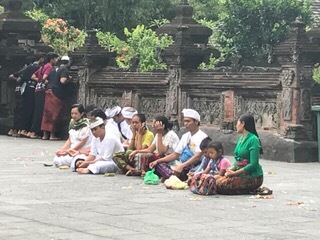 People come to the temple to purify themselves. 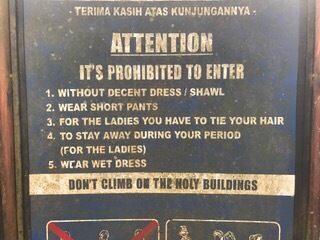 We again had to wear sarongs to enter and I was glad to be past the age of menstruation or I could not have entered during that time! 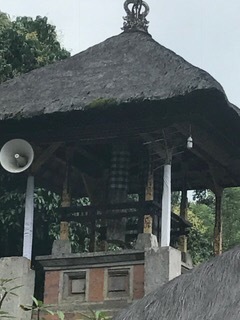 wooden bell tower, the bells are made of wood. 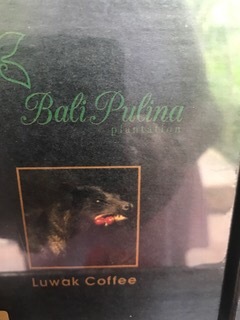 Our last stop at Bali Palina was to taste the coffee that is made from beans that are eaten – the animals love the ripe red coating – and then retrieved from the droppings of the Luwak, boiled and roasted. 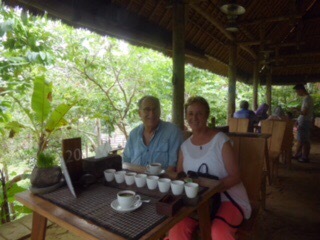 We had a tasting of their many teas and coffees. The one from the droppings is very strong! 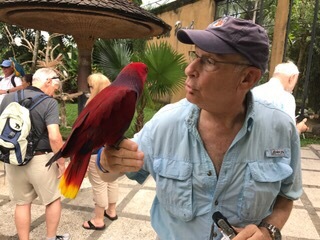 This was again a beautiful tropical setting. 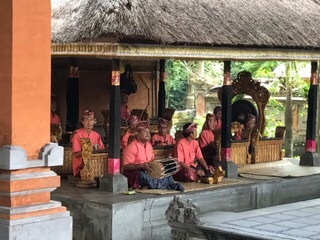 On the way back from a wonderful day, we saw several road closings for ceremonies – and people traveling to and from the ceremonies. 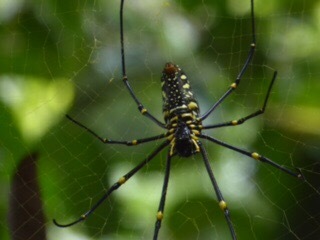 And they have some pretty impressive spiders here too! 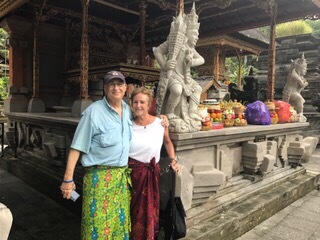 We definitely want to return to Bali, and please let me know if you want to go and I will highly recommend Nyoman! 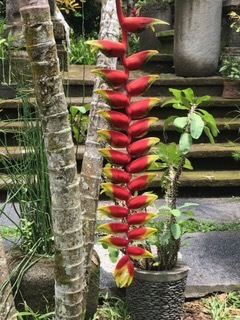 lucky you,, you had two days in Bali…. we had one and woud go back in a heart beat,,so much beauty and things to see,,,thanks for sharing some of the places we hadnt been to..